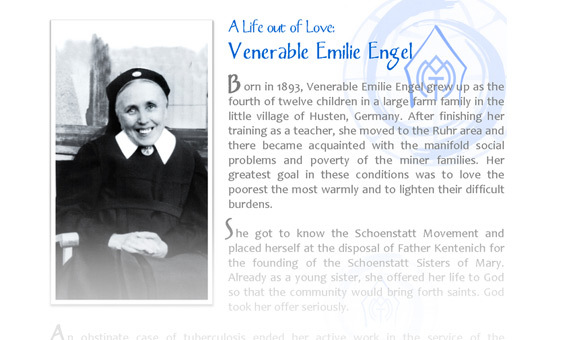 A translation of the "Cause of the Beatification and Canonization of the Servant of God Emilie Engel"
On May 10, 2012, Pope Benedict XVI authorized the publication of the decree on the heroic virtues of Sr. Emilie Engel. The decree was subsequently published in 2013 in Acta Apostolicae Sedis (vol. 6, pp. 493-96). What follows is an unofficial translation: the Vatican typically does not release official translations of these decrees. These words, drawn from the will of the Servant of God Emilie Engel, testify to the lofty sources of her talents and spirituality, and certainly to her ever prompt consent to the will of God – a consent that is a sign of her filial oblation in the hands of Divine Providence – as well as to her active participation in the plans of God Himself. The Servant of God was born on February 6, 1893, in the hamlet of Husten. The fourth of twelve children, she lived in the countryside, in a home and in a world profoundly shaped by ardent Catholic piety. After attending her school of initial instruction, she burned with eagerness to become a teacher and, although burdened by financial difficulties, obtained her teaching certificate in 1914. She began her teaching in the district of Grimlinghausen and then was transferred to the district of Börning-Sondingen. She soon showed that she was a capable educator, diligent, maternal, and, at the same time one who especially had concern for the most needy, one rather openly intent on a more determined and fruitful Christian life. In 1921, by the will of God, she was sent to Schönstatt, in order that she might take part in a conference of women who were members of the movement founded a few years earlier by the Servant of God Joseph Kentenich. Here at the shrine, and under the guidance of the founder, she truly experienced an onrush of divine grace: she was illumined more intimately by the image of God the merciful Father, an image that thereafter became for her like a source of liberation from all renewed anxieties. At that time, in addition to the duties of a teacher, she, with all her might and with keen eagerness, used her leisure for social activity for the good of the poor, the needy, and the abandoned. Thereupon, she joined the movement for religious renewal from Schönstatt, in whose diffusion she actively exerted herself, because she had discovered principally that the things sought by her heart were brought to fruition at that place: the vocation to a full oblation of herself to the divine will, to a covenant of love with Mary, and to mutual charity in daily affairs. From that place, the Servant of God, whether in keeping busy at work or in engaging in other matters, made the apostolate the source and summit of her own daily life. On October 1, 1926, she resigned from the position of teacher, in order that she might join the ranks of the founders of the Community of the Schönstatt Sisters of Mary, established by Rev. Joseph Kentenich. Thereafter, she was named first assistant and sent to Essen, in order that she might open a home for girls who had fallen into a certain offense. From 1929 she was entrusted with performing the function of forming the young sisters of the Institute. In 1935, however, when she was seized by a penetrating tuberculosis of the lungs, she then had to resign from this duty on behalf of the community, a duty extraordinarily full of work in social concern and in the progress of the obligation of transmitting instruction. The journey of healing, which went on for eleven years, was for her a time of purification in accord with the following of Christ. Through that quick “Fiat, Pater” [Let it be, Father], she surrendered herself entirely to the faithfulness of God in her repeated journey of suffering and uncertain future. In her spiritual conduct, the Servant of God was able to convert her littleness and all her infirmities into a stimulus to a more profound, more interior, more free, and more fruitful life. In the presence of God, she lived more intimately as a daughter, with all her littleness and insignificance. In such a disposition of infirmity and in uncertainties she was, moreover, conscious in herself that she was so loved that she had a fortitude of spirit in enduring the difficulties of life — even up to the full immobility of her own shackled body — with a joyful and calm countenance, as if God had taken seriously the things that she herself had promised to give in her own youthful consecration, namely the offering of herself and the acceptance of all hardships for the salvation of the world. Participation in the sacraments, especially the holy sacrifice of the Mass, and adoration of the Most Blessed Sacrament were the most constant nourishment of her soul – and also the Most Blessed Virgin Mary was a mirror in whose covenant of love the Servant of God cultivated a firm hope, that the Lord might transform all works and sufferings into a blessing. In the charity of God, she welcomed whomever she encountered, all of whom she encouraged and helped in a familiar, spontaneous manner. She was a counselor and help of rather many people in their difficulties. With her health improving, but not fully restored, the Servant of God especially considered the most needy. Meanwhile, the hostile Nazi regime’s oppression of the Catholic Church and of religious associations was growing so much that in 1941 brutal secret policemen seized the very founder of the association and threw him into the Dachau concentration camp, from which he returned only in 1945. And so, unjust power and the events of the Second World War lacerated the Servant of God with harsh torments, but at the same time furnished an opportunity of trusting fully in divine Providence. In March 1946, the establishment and guidance of one of the first provinces of the Institute were entrusted to her; to it she gave the eloquent name of Providence. After a period of six years of work, God asked of her a withdrawal from all things: a deformation of a spinal joint, which a previous surgical incision of the lungs had introduced, afflicted her with gradually worsening paralysis. Nor in fact did she shrink from any suffering: compelled to continual inactivity in a wheelchair for the feeble, she was able to consign her thoughts only to letters. Patiently, nevertheless, and with heroic excellence, she endured unspeakable sufferings of feebleness and her own increased incapacity day after day, holding for certain that, as she herself said, “God preserves something better for us, if He does not now grant our petitions for solace.” Then, she prepared herself in fullness of awareness to return to the heavenly Father, and on November 20, 1955, she piously surrendered her spirit to the Lord. The pleasing words of Sacred Scripture were accomplished for her: for she had truly become that grain of wheat which, falling into the earth, bears much fruit (cf. Jn. 12:24). Because of her reputation of sanctity, the cause of beatification and canonization was begun at Trier’s episcopal curia, through the transaction of the diocesan inquiry from October 12, 1999, to February 26, 2002; the inquiry’s authority and juridical force were approved by the Congregation for the Causes of the Saints by decree on December 13, 2002. When the Positio [biographical summary] was written up, a particular congress of consultor theologians was held on May 6, 2011, with a positive conclusion. On January 17, 2012, when the relatio [report] of the ponens [proposer] of the cause, Cardinal [Paul] Josef Cordes, was heard, the cardinal fathers and bishops in ordinary session at which I, Cardinal Angelo Amato, presided, declared that the Servant of God exercised the theological virtues, cardinal virtues, and virtues connected to them in a heroic manner. Finally, after an accurate report about all these things was made to the Supreme Pontiff Benedict XVI by the undersigned Cardinal Perfect, His Holiness, welcoming the wishes of the Congregation for the Causes of Saints, and regarding them approved, declared today: that there is certainty about the theological virtues Faith, Hope, and Charity, both toward God and toward neighbor, and also about the cardinal virtues Prudence, Justice, Temperance, and Fortitude, along with the virtues connected to them, in a heroic degree, of the Servant of God Emilie Engel, from the Secular Institute of the Schönstatt Sisters of Mary, in the cause and for the effect under discussion. Moreover, the Supreme Pontiff ordered that this decree be made a matter of public authority and that it be recorded in the acts of the Congregation for the Causes of the Saints. Given at Rome, on May 10, in the year of the Lord 2012. How Do We Advance Subsidiarity?